Your favorite heros are in the new WAKFU Season 3 trailer. Evangeline, Percedal, Amalia, Yugo and Ruel find themselves in the heat of battle once again. They'll have to stay on their toes to keep from getting burned! It's the fourth week to treat yourself and have the satisfaction of contributing to the creation of your favorite animated series! Not only are there new items and new packs, but the items and packs from previous weeks are also available. You have so much to choose from! Every Thursday throughout November, we will be offering you new items and new packs! Treat yourself and enjoy the satisfaction of knowing that you're contributing to the creation of your favorite animated series! And so 2015 draws to a close, it is time for the arrival of 2016 (and some gifts too!) 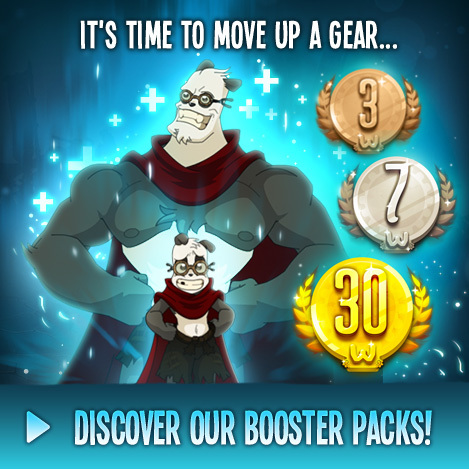 Behind each gift are exclusive images from Season 3 of the WAKFU Series. How to unlock these gifts? Share the hashtag #WAKFUXMAS on social media!